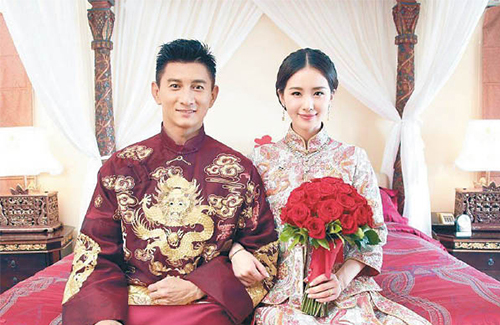 Married since 2015, fans of the real-life Scarlet Heart <步步惊心> lovers Nicky Wu (吳奇隆) and Cecilia Liu Shishi (刘诗诗) have been dying to know about Cecilia’s rumored pregnancy, which really started to take flight after the couple were spotted visiting a Buddhist temple in Kyoto, Japan this past April. The temple—the Kiyomizu-dera—was established in the year 778 and is traditionally known to server visitors who are trying to get pregnant. Nicky and Cecilia continued to stay hush on the pregnancy rumors, but in September, Nicky updated on his social media page that he was visiting UCLA Health in Los Angeles. UCLA Health is known for having an extensive network of obstetrics and gynecology clinics. In October, a netizen suddenly congratulated Cecilia for carrying twins—a message that took the Internet by storm. When Cecilia attended a public fashion event that month—her first public appearance in months—netizens noted that she was dressed in a way that strategically hid her protruding belly. On December 15, a source told gossip circles that a “three-character celebrity with the surname L” (assumed to be Cecilia) is pregnant with twins, and she obtained her pregnancy through in vitro fertilization (IVF). The process of IVF can be physically taxing for the mother, as Cecilia was required to take injections and medications that resulted in weight gain and bloating. Cecilia’s morning sickness had been particularly difficult, and she had been consistently vomiting. Congrats to the lovely couple, my ruo xi and 4th prince finally got their wishes! it’s wonderful news that they are finally going to be parents. why would Cecilia need to undergo IVF since she is not that old? LSS is still very young. Some women even they are still young, but it’s hard for them to conceive. It can be for a few reasons like chromosomal abnormalities and some women lose most of their eggs early in life, like in their early 30’s or late 20’s, just as though their ovaries were that of a 40 year old. Also NW is older. @dramas4me Maybe it is Nicky’s low sperm count? He is a heavy smoker. Exactly. I agree with you. Since he is older & was a heavy smoker. Here is also the article that they confirmed LSS is pregnan with a boy.